When Sherrie Walter lost her ear to cancer two years ago, she told herself she'd never be one of those survivors attaching a prosthetic ear every day. "The concept of having to tape something to my skin every day didn't feel like that was who I was," the 42-year-old mother of two told ABC News. "I could just see my kids running around with it, yelling, 'I have mommy's ear!'" But doctors at Johns Hopkins Hospital in Baltimore offered Walter a chance at a new ear -- a permanent one built from her own tissue. The groundbreaking procedure, described as one of the most complicated ear constructions in the U.S., involves removing cartilage from the rib cage to form a new ear, which is then placed under the skin of the forearm to grow. "It was under my arm for about four months," Walter said. "I just thought I was something from science fiction." This week, Walter received some of the finishing touches on her ear, with doctors sculpting and carving tissue to reposition it. "Family and friends say it looks great," Walter said. "I'm not looking until the big reveal." Walter's journey began in 2010, when a sore in her left ear was diagnosed as basal-cell carcinoma, a type of skin cancer. "My dermatologist looked at it for less than five minutes and said, 'You have cancer,'" Walter said. In October 2012, Walter was told the cancer had spread to her ear canal. She went through a 16-hour procedure to have the entire ear, neck glands, lymph nodes tissue and part of her skull removed. That's when a team of doctors stepped in and told Walter she had options. "I described to her how prosthetic ears have to be fixated somehow and sometimes fall off," said Dr. Patrick Byrne, an associate professor in otolaryngology-head and neck surgery at the Johns Hopkins University School of Medicine. "Sherrie's skull bone had been removed, so the only way of attaching a prosthetic would be through tape and glue. We both agreed that wasn't an option." Byrne, who pioneered the procedure, said most ear reconstruction uses facial and neck skin, but most of Walter's skin had been removed from those areas. 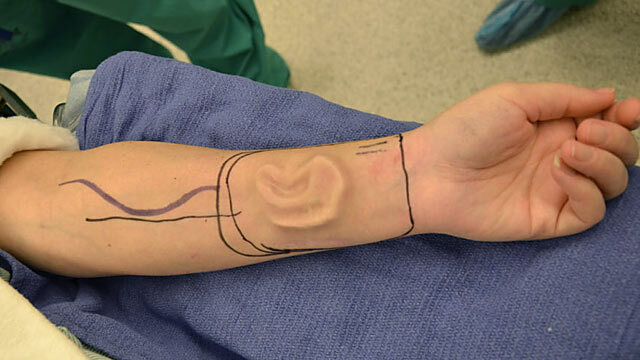 Doctors opted to place the ear under the forearm. "We've talked for years about finding the right patient, in terms of age and health and a good support system. Sherrie had all that," Walter said. In November 2011, Walter's new ear was inserted under the surface of her forearm skin. "We implanted the ear near the wrist and just let it live there so all the skin could grow," Byrne said. After four months, the ear was removed from her arm and re-attached to her head. The entire process took 20 months. Since the re-attachment in March, Byrne and his team have been working on the cosmetic aspect of the ear, fully matching it to her right ear. "Her reveal will be in about a week, and that's going to really be an amazing," Byrne said. For Walter, the reveal of her new ear is the opportunity to give other cancer survivors hope. "I just want people to learn from the story and understand that they have options out there," Walter said. "Talking to your doctor and realizing you have options. Because honestly, anything is possible."